UK natural and organic brand ORGANii has launched the Intensive range for delicate, dry and sensitive skin that is prone to eczema, psoriasis and rosacea. ORGANii teamed up with holistic health practitioner and herbalist Hannah Pearson to create the range, which is vegan, cruelty-free and certified organic and natural by the Soil Association. Suitable for the whole family, including children and newborns, the products include a powerful blend of sunflower seed oil, rosehip seed oil and nettle leaf extract to help reduce irritation and speed up skin repair, alongside ingredients known for their ability to ease itching and inflammation. 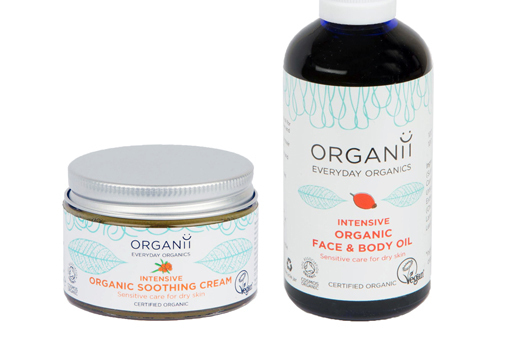 The two-strong range comprises of ORGANii Organic Intensive Face & Body Oil for everyday care, and Intensive Organic Soothing Cream, which can be applied to dry, sore skin as often as required, reducing applications as skin improves. RRP £29.95 each.